First of all, let’s get this straight — I don’t think anyone is purely against the people who pull coal out of the ground, the people looking for steady jobs and decent income, or the people who try to help other people from losing their jobs. But we are against burning coal for electricity, because that causes ~$500 billion a year in human and societal harm in the United States alone, and we now have much cleaner, cheaper options. Once upon a time, burning coal was important for bringing electricity to more homes and improving the economy. Today, it is just a bad idea. Luckily, the giant is falling … and you know how large things fall. Unfortunately, some of the effects are not pretty, and some of the falling process is intent on wreaking more havoc. First, I’ll expose some of the encouraging numbers, and then the political nonsense. 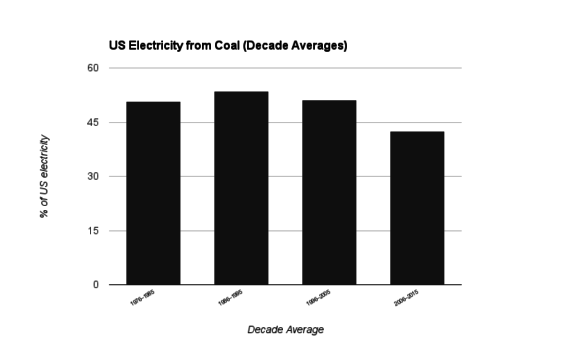 Approximately 2 years ago, burning coal accounted for ~40% of US electricity (41% in March 2014 … and 39% for 2014 as a whole). Now, it’s down to ~24% (23.8% in March 2016, the most recent available month from the Energy Information Administration). Was it just a “bad month” for coal (and good month for humans who don’t want cancer, heart disease, or other coal-related problems)? Well, it was a bad month, but it also followed a clear trend. 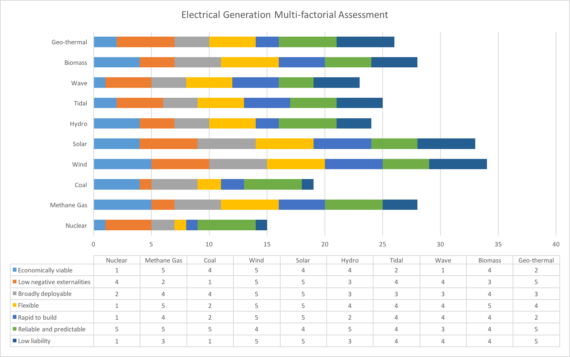 Thanks to CleanTechnica community manager Bob Wallace for the info/data on this, collaboration on the charts (leading the work on them), and the push to write this article. The future doesn’t look any brighter for the industry, with many excessively dirty coal power plants reaching the end of their lives, new power capacity being dominated by renewables (99% in Q1 2016) and natural gas (alongside renewables in 2014 and 2015, but hardly registering in 2016 so far), and coal simply not competing with renewables (or other sources) in multiple ways. 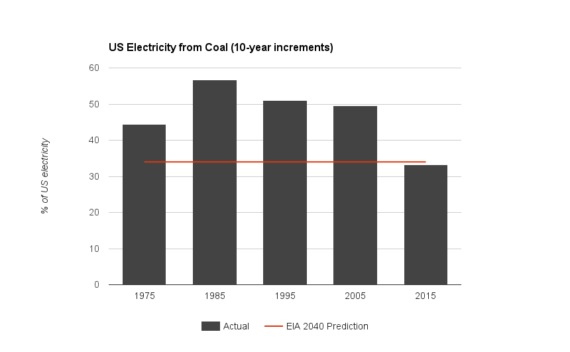 Chart by Mike Barnard, for CleanTechnica. “The industry is on its deathbed” is one way of describing the situation — though, it will be a long, agonizing period of suffering there, since there are still a lot of power plants to shut down. As you can also see, though, the 2040 Energy Information Administration (EIA) projection for coal is actually above the 2015 percentage… how that would be realistic is beyond any logic I can consider worth discussing. Unfortunately, with a decline in the industry, industry jobs are also being lost — the people in those jobs could be transitioned to the energy industries of the 21st century, but governments, corporations, communities, and individuals need to pursue that. Or you could just blame things on the “evil” people trying to bring about societal progress, and push people losing their jobs to vote for someone promising to do the impossible and grow the shrinking coal industry. Coal baron Robert Murray followed that advice recently — while announcing plans to lay off 4,400 people, ~80% of Murray Energy staff, Murray said the layoffs were “due to the ongoing destruction of the United States coal industry by President Barack Obama, and his supporters, and the increased utilization of natural gas to generate electricity.” Ah, yes, President Obama has that much power, and it has nothing to do with cheap renewables like solar and wind. Graph by Paul Krugman, via NYTimes. There used to be a lot of coal miners, but not any more — strip mines and machinery in general have allowed us to produce more coal with very few miners. Basically, it’s a job that was destroyed by technology long ago, with only a relative handful of workers — 0.06 percent of the US work force — still engaged in mining. So what is this fight about? 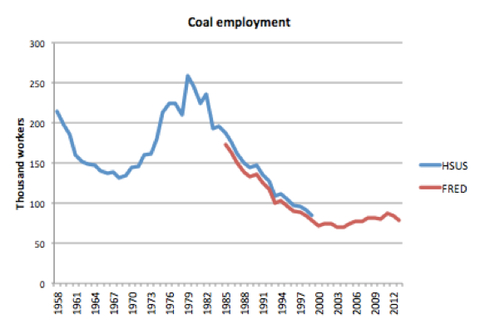 There’s capital invested in coal and coal-related stuff, hiding behind the pretense of caring about the workers. And there’s also ideology, of which more soon. But the war on coal already happened, it had nothing to do with liberals and environmentalists, and coal lost. Indeed. The concern is not for the people, the workers of the coal industry, that political talking points and hype revolve around. The concern is for the millionaires and billionaires who run the coal industry, and who fill the bank accounts of “conservative” organizations and politicians. “Frankly, I am frightened for you, my employees, and the survival of your jobs and family livelihoods,” Murray said in a speech to workers, according to The Wall Street Journal. Their only hope for their jobs, the 75-year-old said, lies in electing “friends of coal” like Donald Trump, the presumptive Republican presidential nominee. That’s not true, of course — not least because the pink slips are set to go out in September, and the election won’t be held until November. But even a President Trump — whose seemingly half-baked plan to save coal would likely only boost its chief rival, natural gas — can’t stop the calamitous decline of the industry. Indeed. But, hey, at least Trump would keep working for human-killing pollution and burning of fossil fuels, causing hundreds of billions of dollars a year in health and environmental costs. Susan Kraemer just wrote about the pending doom for natural gas as utility-scale solar beats it on cost. 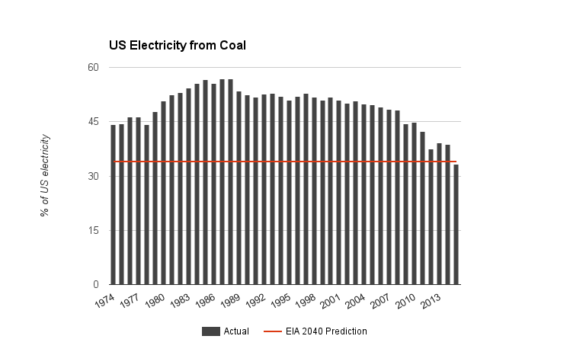 There was no point in mentioning coal, since it is priced out of the market.